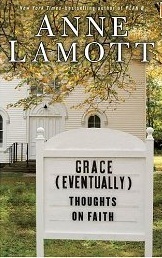 Reading an Anne Lamott book is like chatting with an old friend. I mean a real friend. Someone you can be truly open and honest with, not having to engage in religious pretense. I’ve read a lot over the past 10 years that has offered me a new, broader, better and, I believe, more “Christlike” approach to life. I, of course, know there is always more to learn, but I thought my values, my beliefs, and my theology had been challenged, changed and stretched about as far as they could go. There are many good stories and insights in “Grace (Eventually),” but there were a couple of chapters that really invited me to address even more of my preconceived ideologies. I won’t go into what those chapters involved. I’d rather you read the book, and see what challenges you. Anne is amazingly open about her life. She’s not the type you could threaten with the skeletons in her closet. She has plenty of skeletons, mind you. They’re just not buried away behind the coats and jackets. Instead, we read of a real person in the real world, living out real faith in Christ; worts and all. Just like the people in the Bible. I know, first hand, the freedom in bringing all your skeletons into the sunlight. Like Anne, I have more than my share of them, but no one can use them against me if I don’t try to hide them. She speaks of her alcoholism. She talks of her “binge or diet” issues. Her continual battle with jealousy. Her temper many times gets the best of her. Some would say she needs to be “set free.” But freedom, in that sense, isn’t an event. It’s a life walk. She reveals, often, the joys and struggles of single parenthood, and a number of stories involve her son, Sam. There’s a story of her having to deal with a carpet sales person. He is less that honest. Less than honorable. The end of the story isn’t what you might expect, but there is a good lesson for all to learn. There is so much packed into these pages. So many other life-lessons. There is delicious humor, almost cover to cover. Yet, I found some of the “heaviest” reading I’ve ever encountered. Lessons about dealing with death, working through pain, and, yes, victory in life. Not the kind of “victory” we were taught back in the 70’s. No, this is a much deeper victory. The victory of learning to live through one’s own selfishness and baggage. Of learning that it’s “not all about you.” This is the victory of grace. The music of grace. Grace for others, and even grace for yourself. “If you have an idea after ten p.m., it is probably not a good idea. “It never fails. God will put people in your path that irritate you, especially if you’re prone to be irritated. And this is what I have come to think: That if I want to identify fully with Jesus Christ, whom I claim to be my Savior and Lord the best way that I can do that is to identify with the poor. This I know will go against the teachings of all the popular evangelical preachers. But they’re just wrong. They’re not bad, they’re just wrong. Christianity is not about building an absolutely secure little niche in the world where you can live with your perfect little wife and your perfect little children in your beautiful little house where you have no gays or minority groups anywhere near you. Christianity is about learning to love like Jesus loved. You guys are all into that born again thing, which is great. We do need to be born again, since Jesus said that to a guy named Nicodemus. But if you tell me I have to be born again to enter the kingdom of God, I can tell you that you just have to sell everything you have and give it to the poor, because Jesus said that to one guy too. But I guess that’s why God invented highlighters, so we can highlight the parts we like and ignore the rest. I don’t think you read the Bible to know truth. I think you read the Bible to find God, that we encounter him there. Paul says that the Scriptures are God’s breath and I kind of go ‘Wow, so let’s breathe this as deeply as possible. My wife and I laughed out-loud at this “Jesus Loves You” video. explain away the holes in a lot of theology. Watch the video, then read some comments (below) by the ever insightful Bert Gary. 1. Jesus loves me but I will be tortured forever if I don’t love him back, so there is a “love” that not only allows torture, but requires torture. 2. Jesus has to torture me if I don’t love him though he doesn’t want to, so there is a rule more powerful than Jesus that forces him to do what he doesn’t want to do. 3. Jesus and his Father are very different and are of two different minds about me, so Jesus loves me but his Father’s hate of sin and sinners overrides the Son’s love. 4. Jesus was sent by the Father not to change me, but to try to change the Father’s mind about me and his plan to torture me by threatening me with his Father’s torture-plan, so I must love him in order to stop him from torturing me. 5. Fear then is supposed to make me love, making fear more powerful than love and making love dependent upon fear. This theology is fundamentally founded on hate. The Father hates sin, so he is required to hate sinners. The hate of sinners requires that the Father punish sinners. But apparently there is another “side” of the Father that wants to offer sinners a loophole. So he sends Jesus, his Son, who is very different from him, to say “I love you, but my Father hates you and plans to torture you forever if you don’t love me back.” This “loving threat” is intended to frighten you into loving him in order to save your own soul. Modern evangelism by and large begins with this fear of hell. It’s their foundation. But if fear is the opposite of faith, and biblically it is, then how can you lead someone to faith with fear? Fear cannot lead to faith. Fear and faith are mutually exclusive. How can we label religious motivation and manipulation of people using fear as “faith”? 1 John 4:18-19 There is no fear in love. But perfect love drives out fear, because fear has to do with punishment. The one who fears is not made perfect in love. We love because he first loved us. This is one of those sequels that I actually liked even more than the original. The effects were, of course, great. But effects alone do not a good movie make. Where this installment succeeded, like the first, is in the writing and the acting. It has the human element. It has heart. It has emotion. And, ever important, it has humor. It has characters we can have fun with, and care about. Downey, as expected, totally delivered. He really is perfect for this role. Paltrow, Johannson, and Jackson were all fine. Two ACDC tunes, along with one from Queen, helped the soundtrack really rock. Hey, good music is always a plus. And finally, let me say that just like the first movie, you’ll want to stay through the credits.